Who should your next manager be? The last few weeks have seen managerial changes at several big clubs around Europe, Moyes coming in at ManU, Mourinho going back to Chelsea, Mazzari taking over at Inter and we could see several more over the summer with PSG, Real Madrid and maybe even Barcelona on the hunt for new managers. So being the good Samaritan that I am, I’ve created a simple Tableau visualization to help fans and supporters of big European clubs figure out who their next manager should be. SO WHAT DO ALL THOSE OPTIONS REPRESENT? Let me just explain what you see in the data viz a bit. The age filter is pretty self-explanatory, the default is an age range from 35 to 55, you can change that to whatever you want. Now for the points range. I’ve awarded points to managers for their achievements over the past 10 years in the “big 7” leagues in Western Europe and UEFA’s Champions and Europa League. So you adjust the age and points range filter, and you get a shortlist of managers in the middle. You click on a name there and on the right of the shortlist, you’ll get to see that particular manager’s record for the past 10 years. 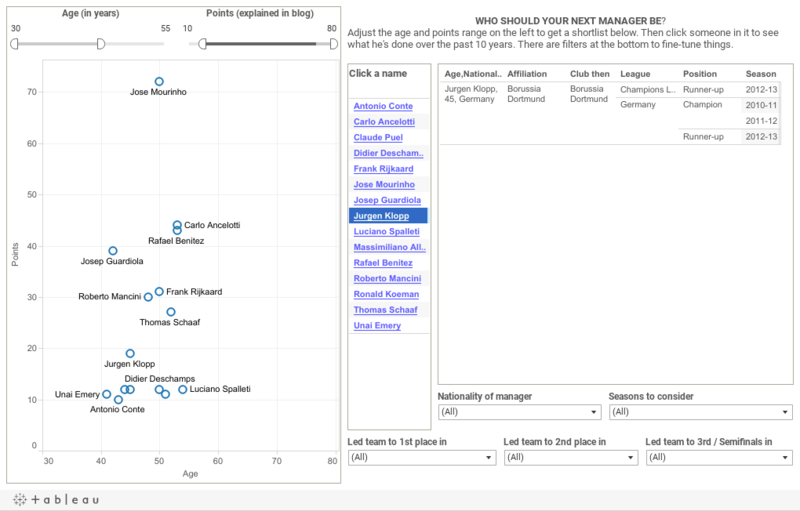 And if you want to fine-tune things further, you can use the filters at the bottom to choose managers by nationality or if you want, you can use the “Seasons to consider” filter to only take the managerial record over the past five years into consideration, if you think the default of 10 years goes a little too far back. With the “Led team to 1st place in” and other filters of its kind, you can deselect certain leagues like the Portugese Primeira Liga if you think winning a title there shouldn’t matter and that managers should only be judged by their achievements in the “bigger” of the big 7 leagues. You would be narrowing your selection pool if you did think that way but ultimately those choices are up to you. First off, here’s the link to the complete dataset. Feel free to use it any way you want! I’m an Arsenal supporter and I felt the need to create this data viz primarily to answer the question, “Who should succeed Wenger?”. On the Arsenal-centric Tuesday Club podcast, according to Alan Davies & co, every time they ask themselves this question, they start off with a huge longlist of managers but eventually always narrow it down to David Moyes. (Guess ManU must have started off with the same longlist too!) I wanted to see what answer I would get after going about this task in a slightly more objective manner. So if I want someone in the Wenger mould to succeed Arsene, how would I go about it? As a starting point, I would see what Wenger had achieved before he came over to Arsenal and see which present-day managers in their 40s (Wenger was 46 when he was appointed at Arsenal) have achievements that could match those of Wenger. Now in the 10 years before he took over at Arsenal, Wenger had won Ligue 1 with Monaco in 1987-88, was league runner-up in 1991-92, was a runner-up in the European Cup Winners Cup in 1991-92 and reached the semifinals of the European Cup/Champions League in 1989-90 and 1993-94. Now this is not to say that whoever matches up with Wenger’s achievements will be “the next Wenger”. A resume tells us nothing about the style with which a manager makes his team play or how great he is in developing players. But it’s a good place to start as we can see which manager fulfills the absolute minimum criteria to be even considered for a shortlist. So I may have done this for very personal reasons but ideally, fans and supporters of any big club in the seven leagues should benefit from this and get lists of managers they can fantasize over! I’m sure that they’d be using pretty much the same criteria as I did in selecting the next Wenger. But if they want a potential manager to satisfy, at a minimum, a different set of criteria, they can do that too. Ideally, it shouldn’t and if you were offended by my inclusion of an age filter, I sincerely apologize. But let me see if I can at least make you appreciate my point of view. Now, if you want someone to have a long run at your club, you would expect them to be younger. That is an indisputable fact you can’t escape from. I could be mistaken though in wanting things to be seen from such a long-term viewpoint. Tenures like that of Wenger and Ferguson are anomalies and besides. it wasn’t as if the two of them were granted 15-year contracts at the outset. They got there through a succession of three- or four-year contracts. By discounting managers who happen to be on the wrong side of 55, I am possibly being ageist to my club's own detriment. Now that I think about it, I should make a distinction between the question “Who is the next Wenger” (a question where age restrictions probably make sense) and the very different question “Who could I possibly see managing Arsenal next?” (where the age restrictions should be relaxed). WHAT'S UP WITH THIS POINTS SCHEME? And that’s the thing, it’s more a reflection of how, say, leading a team to 3rd place in the Portugese League ranks compared to winning the Champions League rather than how much bigger/smaller an achievement the latter is. To get all jargon-y about it, it’s an ordinal ranking that’s been converted into a crude cardinal score. 2) As I mentioned earlier, the data viz tells us nothing about the manager’s style or how well he gets along with everyone (For eg. Mourinho’s excellent resume tells us nothing about how abrasive he is or how destructive he is when it comes to relationships within a club). So all that this visualization tells us is about how the manager looks on paper. 3) Club managers outside the seven domestic leagues are ignored in this. For example, Mircea Lucescu’s trophies with Shakhtar Donetsk in the Ukrainian league are ignored because I don’t think the Ukrainian league is up to the standard of any of the big 7. Because of this, even those managers are penalized who may have made a name for themselves in the big 7 leagues but then moved elsewhere. For example, managers like Luciano Spalleti of Zenit St. Petersburg in Russia or Guus Hiddink of Anzhi Makachkala. On a side note, I wish I could have included the Russian league. It’s attracting top coaches, players and there’s a lot of money going around, but I doubt how well Russian coaches (like their players) “travel” outside Russia. So I don’t know whether Leonid Slutski, a 42-year-old Russian manager who led CSKA Moscow to the title recently, could do a “job” or do well in Western Europe. Also if there happens to be foreign coaches there, they’re inevitably ones who have made their name in the big leagues. So the names of foreign coaches from Russia will still appear in the results, just that they won’t have done as well under my points scheme. 4) It penalizes managers who may have taken jobs with national teams during this 10 year period. So people like Guus Hiddink and Fabio Capello have suffered. 5) The data viz also disadvantages managers who have had some time off from the game, not because they weren’t getting job offers but because they wanted to spend time with the family or take a ‘sabbatical’ (Guardiola) or were waiting for the right opportunity to come up (Benitez). Genuinely wish there was a way I could un-penalize this group. 6) Another problem is that with all these achievements, you can’t really control for all other factors and separate out what the contribution of the manager actually was. For example, how much was Chelsea’s success in the Champions League down to Di Matteo? I’m reminded of something (I'm guessing?) Guardian journalist Barry Glendenning said on a football podcast about how Di Matteo then was the equivalent of a teddy bear tied to the front of a runaway train. It could just be that the Chelsea team was that good (or that lucky!) and any manager (other than Villas Boas) could have won them the Champions League. It also works the other way in that a manager could be really good but because his team isn’t that great, it’ll take time for him to build a name. For eg. Frank De Boer may be a great coach, he’s led Ajax to the third successive title in Holland. But because his Ajax team are never strong enough to compete in Europe, he will never do as well under the points scheme as he could with a bigger team than Ajax. 8) There might be also be a bias towards managers of a certain age. If you’re interested in the age breakup of the managers, it’s here. In a way it’s understandable because someone younger won’t get the same kind of opportunities to manage a big club, unless they happen to be a prodigy like Andre Villas Boas or unless they happen to be famous players shifting immediately to management like Didier Deschamps did when he managed Monaco. You usually don’t get to jump the rungs like that. Most people have to pay their dues the way Steve Clarke did. He had several jobs, including assistant manager at Chelsea, before he made the move up to manager at West Brom. Now I was going to say that this bias towards older managers was because of a “recognition lag”. That it takes bigger clubs time to realize how good a manager is and that by the time they do, the manager would have already passed his 40s. The problem with this idea is that it assumes that a manager’s ability level is static and can’t improve with time. The thing is managers do improve with experience and that could be the reason why bigger clubs go for more seasoned managers and this isn't the outcome of some recognition lag. Only go on further if you want to punish yourself! --If there's a question mark next to a club or country under “present affiliation”, it means that a manager’s position was in doubt at the time of writing and might well have changed by the time you read this. --There are some choices I made that seem reasonable to me but are essentially debatable, so thought I should catalogue all of them. 2) This relates to Bayer Leverkusen’s 3rd place finish in the German first division last season (2012/13). They had a kind of a joint coaching arrangement between Sascha Lewandovski and Sami Hyppia but since Lewandovski was given the nominally superior designation of “coach” compared to Hyppia's title “team manager”, I'm giving the credit for the 3rd place finish to Lewandovski. 3) The biggest issue I faced was whom to give the credit for a trophy or a placing in the domestic league, if the club had more than one manager during a season. In some cases, it is pretty clear cut, like there is no way Andre Villas Boas could get the credit for Chelsea’s Champions League win in 2011/12 even though he managed them for the majority of the season and Roberto Di Matteo was only there for the past few months. Ok so technically, he did lead them through the group stages so he should get partial credit for Chelsea’s success. But there’s something unsatisfying about giving the credit for a trophy to two managers. So I’ll give it to Di Matteo because, unquestionably, he played a bigger part in the Champions League win than Villas Boas did. In other cases though, it’s difficult to figure out so I (a) used my judgment if I have some memory of what went on or (b) just made a call based on how many months the caretaker manager was in charge after the first manager was fired/quit/resigned/moved to another club etc. And lastly, I want to thank everyone who may have retweeted my link to this post. I don't have many followers, so it’s difficult for me to get the word out without shamelessly spamming Guardian comment sections or begging more influential tweeters for retweets. So thanks again everyone! Should Europe get fewer World Cup spots? We’ve got two weeks of international football coming our way, so I thought I’d do something on the World Cup and who gets to qualify for it. Specifically, whether certain confederations (to borrow FIFA’s terminology) like UEFA or CONMEBOL (the South American equivalent of UEFA) are over-represented at the World Cup. So what do you get in the visualization? 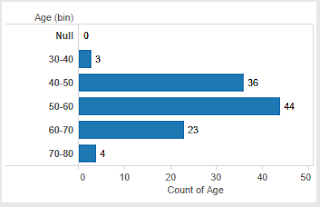 There are three charts- top-left is a bar chart which shows us how many slots out of the 31 available should be given to a confederation according to the various criteria mentioned. You use the drop-down menu to select a confederation, and the bars will resize according to the confederation’s ‘strength’ in the respective field. If you look to the right of the confederation drop-down menu, you will see an option for ‘Actual no. / percentage’. If you select ‘percentage’, what it does simply is recalculate with the base as 100 instead of 31 in the ‘Actual no.’ option. Incidentally, changing that will affect both the bar and the pie chart to its right. 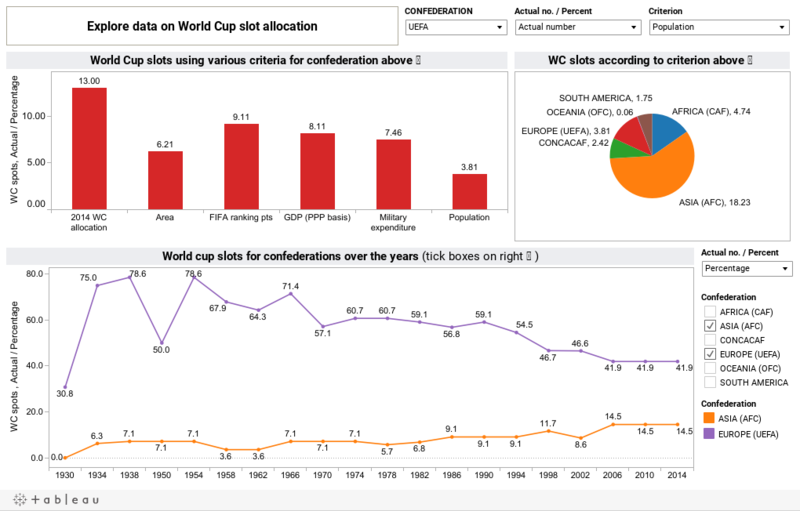 The pie chart is nothing but the distribution of seats among the various confederations according to the criterion you choose in the drop-down menu above it. Finally, the line chart at the bottom gives us the number of slots awarded to each confederation over the years. So you tick the boxes of the confederation you’re interested in learning about and lines will appear along with a colour legend to let you know what’s what. Again, you can get the actual number of slots competed for or you could get the percentage of slots awarded. In this case, using percentage makes the figures comparable across years, because the base kept changing as the tournament got bigger, from 14 to 22 to 30 and now 31. So using percentage instead of the actual number of slots gives us a truer picture of how confederations have been treated by FIFA over the years. If you want some initial advice on what options to choose, I have just two words for you--dig in! Now you can pretty much guess what most options will result in. (With two exceptions that I will come to later.) For example, if you choose population for the pie-chart, you know that it will grant the majority of slots to the Asian federation because China’s there. Or that if you choose military expenditure, CONCACAF (Confederation of North, Central American and Caribbean Association Football) will get most of the slots because of the US and its huge defense budget. 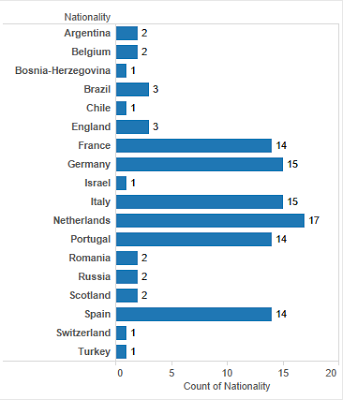 What I did find interesting was that if you take the UEFA option in the bar chart, according to every single criterion I use, the 13 seats Europe has been allocated is more than it deserves. (That should be the default view you’re presented with as your data viz loads.) Apart from Europe, if you click on Oceania and look at the FIFA ranking, Oceania is surprisingly under-represented. Long the forgotten step-child of FIFA, its winner having to compete every 4 years in a playoff with a nation from Asia or South-America depending on which side of the bed Sepp Blatter’s gotten up from, it seems its member states have actually been doing well enough for the region to get its own automatic qualifying spot. The way things are now, spots at the World Cup are gained and lost through a long attritional process of negotiation and horse-trading and there is hardly any transparency to the procedure at all. There is no periodic reassessment of the slots a confederation is awarded, in the way UEFA does when it takes a Champions League spot away from Serie A and gives it to the Bundesliga; not because the German FA haggled harder but because German teams performed better and a consensually-agreed upon statistical formula rewarded them for that. I realize that this is an issue that most people aren’t really aware of but if I’ve made this an issue that people discuss, or at least think about, then the purpose of this blog-post is served. Things are going to get a bit boring from here on out, so if I’m already testing your patience with this long blog post, you can get on with the rest of your day. Thanks for stopping by! Ok, now to explain my methods. Now why did I choose these criteria? I guess I took the ‘world’ in ‘World Cup’ a little too literally, and was determined to find out how much of the world was actually represented at the tournament. So factors like area covered and population size seemed natural indicators to use. GDP (PPP), I guess, was used as some sort of proxy for economic power and military expenditure as a proxy indicator for political power. I still have reservations over using military expenditure but in the absence of another readily-available indicator I could borrow to represent political influence, SIPRI’s data will have to do. I kind of anticipated the objection people would make that the World Cup is not just about representation but also about merit and about the world’s best teams playing each other. So I used FIFA’s ranking data to arrive at some kind of meritocratic measure. In order to arrive at the strength of a confederation, what I did was calculate the average number of points of the top 10 nations in each confederation and used that to arrive at a weight. Now I think that’s a relatively unsophisticated but still reasonable way of going about it but if anyone has a different and better idea of how it should be done, do let me know at ultimateposeur@gmail.com and I'll make sure to incorporate that method in the next visualization I make (whenever that is). I'd also be interested in seeing your take on this and in fact, I would welcome it if you could use the dataset provided and make your own graph, chart etc. with your software of choice. The historical data for the line chart I got from, where else?, RSSSF.com. --Now all the SIPRI figures are from 2011 and I've taken a few shortcuts that academics might have heart-attacks over, such as using 2009 figures when there are no 2011 figures available for a country. Now this isn't meant for publication in an academic journal, so I think getting some sort of idea is better than having no insight at all. --This is what I did, I took the figures for Central African Republic from 2010, Benin from 2008, Equatorial Guinea put at 0, Iceland from 2009, Iran from 2008, Reluctantly put North Korea at 0, Libya from 2008, Luxembourg from 2007, Malawi from 2007, Mauritania from 2009, Myanmar at 0, Somalia at 0, Sudan from 2006, Qatar from 2008, Tajikistan from 2004, Turkmenistan from 1999, Uzbekistan from 2003, Yemen from 2008. Also, countries put at 0 are most likely not at 0, did it that way because SIPRI didn't have figures for them. --What created additional problems for me was that FIFA used to adjust qualifying places according to which continent was hosting and whether a country from that continent was the defending champion. For eg. In Italia 90, countries from South America were competing for 2.5 places, instead of the 4 places on offer in Mexico'86 because Argentina was the defending champion. So then the Q. is whether I should consider CONMEBOL as up for 2.5 slots or 3.5 slots including Argentina? --Up to and including 1982, Oceania didn’t have a separate group of its own but instead was treated as part of Asia. There were quasi-Oceania type groups though in the Asian zone for the 1978 and 1982 World Cups but not before that. --Africa only got a separate slot of its own from 1970 onwards; there were combined Asia, Africa and Oceania groups before that. COMMENTS INVITED -- BE NICE! If you have to be critical, be gentle, imagine that I'm a friend standing in front of you and you're trying not to hurt my feelings but still hope to point out where I went wrong. Please don't use the fact you're not with me in person as a license to be mean!